I love strawberries! But. you know, sometimes the shop-bought ones might look large and scrumptious but can be a bit tasteless. 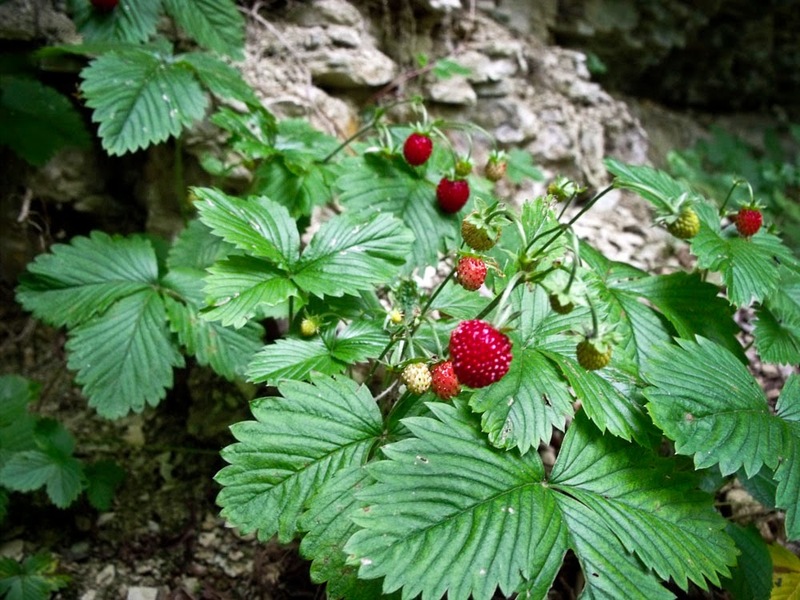 It was a joy then to come across some wild strawberries, fragaria vesca, growing in the forested hills around Jena. In Germany they are called Wald-Erdebeeren or 'strawberries of the forest'. There is a delightful Brothers Grimm fairytale (isn't there always?) called 'Die drei Männlein im Walde' (the Three Little Men in the Forest'). It is the typical tale of a wicked stepmother who spoilt her own daughter and abused her stepdaughter. So one day the stepmother sent the stepmother into the woods in Winter wearing only in a paper dress and with only a crust of hard bread. This was of course futile; I have taken this photo in late June, and you couldn't possibly find strawberries in Winter. Or could you? Maybe you could if like her you came upon three dwarves who invited her back to their place. Oh yeah? Anyway, they asked her if they could share her bread, which she did because she of course had a kind heart, and then she offered to sweep their back steps. I don't think that is a euphemism, because surprise surprise she found the strawberries that she had been ordered to bring back to the stepmother. The dwarves were do taken up with the girl's kindness that they each spoke a wish: that she would grow more beautiful every day, that whenever she spoke a gold coin would pop out of her mouth, and that she would one day marry the king. When she returned home she was met with the envy of her step-sister at her good fortune, who also wanted a part of it. The stepmother wouldn't allow her natural-born daughter out into the forest in the cold of Winter, but the daughter insisted, so she was given lots of warm clothing and bundles of good food to take with her. The step-sister met the three dwarves, but no way was she going to share her food, never mind sweeping any back steps. So the three dwarves each gave their wish upon her: that she would grow more ugly every day, that each time she spoke a toad would fall out of her mouth, and that she would die a horrible death. And so it eventually came to pass after more fairy-tale nastiness that yup, the step-daughter did end up marrying the king, whereas her stepmother and stepsister were killed by being rolled down a hill in a barrel stuck through with nails into a lake where they were drowned. I didn't see any little men in the woods, but I did pinch a strawberry, and my was it good!